I saw Rush back on Wednesday. Here are my impressions of the audience I watched it with. Last Wednesday was an advance screening of the movie Rush in Berkeley only for UC Berkeley students. I'm not going to talk about the movie, because it is seriously worth watching, and I don't want to stop anyone from having a good time. If I get a lot of requests for a review, I might just do one, since I didn't sign a non-disclosure agreement. What I will discuss are the people I encountered while standing in line for the sneak preview. Unfortunately, my racing buddy couldn't make it to the movie because of work so it was only me waiting in line, with pass in hand. Since I am an immense racing fan and knew all the details about the Hunt-Lauda rivalry in 1976, I thought I would chat with the group in front of me about the movie and what they were looking forward to. After playing a round of trivia with the group about Ron Howard movies, a girl gets in line behind me. I'm thinking, "A single female racing fan, waiting to watch Rush. Maybe I have a shot." I ask her if she's into racing. She says no, she just wanted to see a free movie and is waiting for her boyfriend, who also turns out not to be into cars. Finally, when I walk into the theater, I see someone I know (he's a Lamborghini guy and was wearing a Lamborghini T-shirt to the premiere). He's with a buddy who's also into cars. However, I know for a fact they know almost nothing about Formula One, if not the 1976 season. Throughout the movie, I'm just staring at the screen, trying to soak up as much of the movie as I can, and comparing the stories on screen to what I know about the rivalry in real life, while the other two can't fathom how F1 worked in 1976. Despite me loving the story and Formula One, this movie is not just for racing nerds. 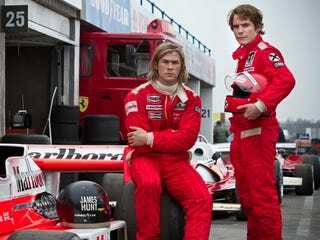 There is something for everyone, and I can say the audience came away liking the movie, empathizing with Niki Lauda and James Hunt. A lot of them were laughing at their banter and gasping at the display of injuries. The audience definitely felt the emotion of the movie, something which Ron Howard did very well. In the end, despite most of the UC Berkeley audience knowing next to nothing about Rush, I came away with the feeling that most of them enjoyed the movie, and would recommend it to others. My only qualm is that I didn't encounter any racing fans who to whom I could talk about the movie. There might have been a few racing fans among the 50 or so people in the theater, but I didn't encounter them, so I don't know their impressions. But racing fans will love this movie. Ron Howard got most aspects about the season down. If there is anything I'm hoping for out of Rush, its that more Americans become aware of Formula One and its competitiveness, and will start watching F1. Special thanks to Business Careers in Entertainment Club- BCEC Berkeley Chapter and Universal Pictures at Cal for the advance screening. All pictures are by Universal Pictures. Can Oppo Come Up With Some Outlandish Tests For This Car?